Did you know over 5,400 burglaries occur per day? We know that business owners are concerned about securing their livelihood, customers and employees. Our commercial burglar alarms have hybrid ability to accept both hardwired and industrial-grade wireless zones that are encrypted for security and that have a very long range. This combination of hardwired and wireless offers the ultimate protection against unwanted intrusions. Plus, all our alarms communicate to our monitoring station via cellular communicators, which allows for very fast and secure alarm transmissions to the monitoring station. It’s every business owner’s nightmare, an armed person invading their place of business. American Alarm believes in giving you protection when you need it, at the touch of a button. We offer both wired and wireless panic/holdup buttons to ensure that help is on its way quickly in the event that an employee feels threatened or is in danger. The intruder does not even need to know that you have alerted the authorities! 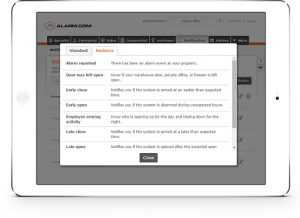 Our alarms can generate reports that show which employees arm/disarm the system and what time they did so. In most cases you can access this information anytime, anywhere through the use of our Remote Alarm Management smartphone app. A web portal that allows for easy management of the security systems of multiple business locations. Give us a call today to set up an appointment for a free quote!